The previous Open Thread has gone past 550 comments, so it’s time for a fresh palette. I am reminded of a Johnny Carson show many, many years ago when he had Dixie Lee Ray as a guest. I think it was around 1973, and she was the new chairman of the US AEC, and Carson engaged her in a discussion about energy. Carson clearly favored solar and wind. She posed a question to him about the value of nuclear energy which went something like this—If you had several hundred freshly cut very tall and heavy trees at the top of a mountain, and you needed to get them down to the river, what would rather have: a couple of bull elephants or several million ants? Which would you chose? He was nonplussed as I recall to say the least. I never forgot that story. For small jobs, the solar/wind sources can be useful. For the really heavy lifting—nuclear is your winner. There simply is nothing else waiting in the wings. Note 1: For reference, the last general open thread (from 7 June 2011) was here. Why another one so soon, I hear you ask? Well, blame yourselves, you worked the last one over too quickly (almost 600 comments accumulated), and this payload slows down the thread loading too much. Hence, a fresh canvas for you. Note 2: I have now added the BNC animated video as a permanent widget, located at the top right hand column of the blog — so it will always be easy to find (and, I hope, will act as an introduction to the site for those who are visiting for the first time). 1. Reports indicate that some fuel melted and fell to the lower containment sections of units 1-3, where it dispersed in a fairly uniform residue — but this does not seem to have breached containment in any of the reactor pressure vessels. 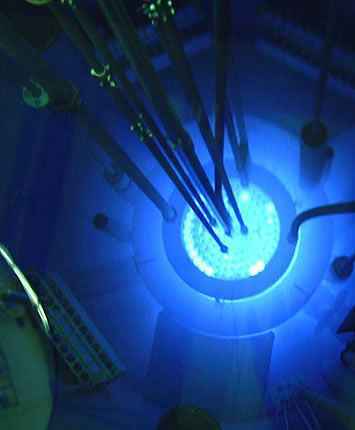 Re-criticality of this ‘corium’ seems very unlikely, but no details can of course be confirmed until the reactor cores are finally dismantled — which may be years away. 2. Two automated PackBot robots entered units 1 and 3, took photos, and measured temperature, pressure and radioactivity within the buildings. Peak levels were 40-60 mSv/hr. 3. An anti-scattering agent is being sprayed on the ground around the damaged units (about 1,200 square metres in area) to prevent further spread of radionuclides (see photo above). 4. Excess radioactive cooling water continues to be transferred from unit 2’s basement and tunnels to a waste processing facility. 5. Further surveys are being made of the area surrounding the Fukushima evacuation zone and the exclusion area is being policed more strictly. Highest levels were measured at Itate, at about 4 microsieverts per hour (by comparison, the background level is 0.2 — 0.4 uSv/hr). 6. TEPCO have now released a roadmap plan for the restoration of stable conditions at the site, over a 3 — 6 month timetable, leading to a cold shutdown at units 1-3 and various other stability targets. They also released a 27-slide presentation on the timeline of the accident and current situation, that is definitely worth a look through. It was suggested in a comment — and I agree — that the previous open threads on the Fukushima Daiichi Nuclear Accident were becoming difficult to read, because they are such a mixture of technical details and philosophical discourse. That is, it’s generally a bad idea to cater to two different audiences in one comment thread. So, I will split them up. Please restrict all discussion here to technical information, analysis, criticisms and questions on FD — no philosophising or excursions into whether nuclear power is ‘good’ or ‘bad’ or the implications of FD for the future of nuclear power (except for new technical developments, e.g. safety standards), etc. You may impart your deep wisdom on how the world should work on the other open thread I’m about to open. Besides the above guidelines, the other rules of the Open Threads on BNC apply. Read here for details.